Photographers LOVE to tell other photographers to raise their prices. While I believe there are many, MANY good reasons to raise your prices, and I’ve told other photographers that they should raise their prices as well, there are several good reasons why this is sometimes a poor decision. So let’s jump in and consider the times when it’s a bad idea to raise your prices. You’ve worked through numbers and you are confident in your photography pricing. You know exactly how much you are making, how much your expenses are, how much tax you’ll pay, and how much you’ll be bringing home at the end of the day as a paycheck from your photography. If you’re happy with the amount of money you’re making, and how much work you’re doing to make that much money, there’s no need to raise your prices. While raising prices may mean more money for less work (particularly if you’re under-priced for your market), you’re totally justified in staying where you are. Consider it the gift of knowing your numbers. If you’re burned out, or don’t know exactly how much you’re making after all is said and done, then maybe a price increase is justified. 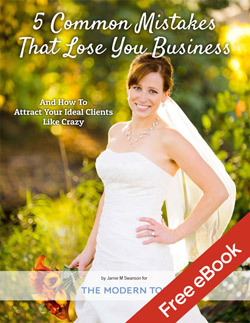 Work through the free photographer’s pricing guide series and find out. I HIGHLY recommend buying the pricing workbook to go with it to make it easy and save tons of time. There’s two different scenarios where this applies. First, you may not be exactly where you want to be with pricing, but you’ve created a pricing plan to get there in increments and it’s not time to raise them yet. In this case, I’m talking about a concrete plan that you’ve actually worked out and are committed to, NOT just a “I don’t think that I can yet but will eventually” kind of plan. Put it on paper. Run the numbers and know them, and then stick to it. Know where you want to be in 3 years, and determine how much you’ll raise your prices every 3-6 months to get there, and then just do it. And don’t feel obligated to do it earlier, even if people tell you that you could or should. Second, you may upsell like a pro and make a LOT more after the session or wedding so you don’t need to charge as much up front, so you’re still making plenty but people think you’re making way less. If you know your numbers, you’ll know if this is the case or not. What you charge is a type of branding and will directly affect the TYPE of client you attract. If you charge very little, you’re going to attract people who are looking for a deal or who are price shoppers and turn away people who value photography who will think you’re cheap because you’re not as good as someone who charges more. As a service provider who only has so much time, this is generally not where you’ll want to find yourself, and people who hire you based on price tend to be difficult to work with (although not always). Charging higher prices attracts people who value photography more. People only looking for a deal will say you are more expensive and won’t hire you. However, if you are the most expensive photographer in your area by far, you may be hired by high-end clients simply because you are the most expensive and not because they love your work or really value photography. If this would make your heart sad (as my daughter loves to say) and take the joy out of the job, you may not want to raise your prices to that point. Know who your target client is and know what your prices imply to them. If you can make enough at your current prices and like what they “say” to people, then there’s no reason to raise them. The more you charge, the fewer clients you need to make the same amount of money. This is rather nice, to make more money doing less work. However, the more you charge, the more you have to work to get clients, so if you’re happy with the amount of effort it takes you to get clients then don’t raise your prices. It’s harder to book 1 wedding at $20,000 than to book 10 weddings for $2000 each, so you have to find a good balance. Just don’t let this end up being an excuse for you when you’re actually just afraid or burned out and don’t WANT to raise prices. If you work a full-time job or have a spouse that brings in enough income and you don’t really need much income from photography, then there’s no reason to raise your prices just for the sake of raising them. The nice thing about this situation is that you CAN raise your prices without fear because if you don’t book enough business, it’s not a big deal and you can always lower them again. It’s a fabulous place to be. If you keep hearing from other photographers that you need to raise your prices because your work is worth it, but you have a good reason not to, then don’t do it. Your work MAY be worth it, but that doesn’t mean you have to raise your prices if you don’t think you should. Other people do not always have your best interests in mind. They might if they are a trusted friend, but if not you never know. Maybe they’re tired of you taking business away from under them. Maybe they’re bitter about the fact that they’re having a hard time getting business at their own high prices and think that if everyone just raised their prices they’d have an easier time at it. You just don’t know for sure. Yes, it helps the entire industry when everyone charges more, but let’s face it. You are running a business, and you need to make the decisions that best serve you because the industry won’t care if you go under. Don’t let other people pressure you into making changes when they don’t know your numbers and they don’t know your situation. Let’s face it: not all markets are the same. The market in New York is way different than in rural Australia or in the UK. Know your market. Know where you want to fit within your market, and don’t let someone from a much more lucrative market convince you to change your pricing if they don’t know what you face. Now, your market may not be where you live, so it shouldn’t limit you. Just know who you are targeting and what typical values they are willing to pay would be, and that will help you know what you can and can’t charge. For example, the more established, successful wedding photographers who shoot in the state of Wisconsin almost all start under $4000, with most starting around $2500-3000. If a photographer from Wisconsin were to move to New York, they’d immediately have to raise our prices significantly in order to be perceived as being in the same tier as other successful photographers and that their current prices would imply that they are inexperienced or inferior to others if they didn’t because they’d be below what “good” photographers in that market tend to charge. A strong word of caution…. 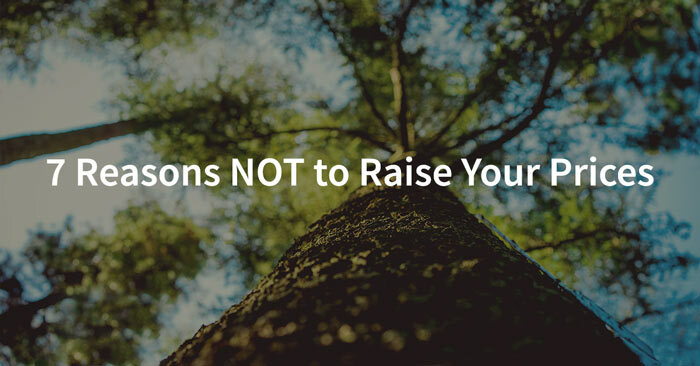 While the reasons above are great reasons to not raise your prices if they are valid, only you will know if you’re just using this as an excuse and not as a true reason to raise your prices. Are you afraid of the increase? Do you just THINK that people won’t pay those prices? Are other people charging that much and getting it? If so, this is an excuse and not a valid point that should keep you from moving forward. Be honest with yourself and your motives. Don’t let the reasons above be excuses when you don’t know your numbers, when you are feeling burned out, and you really should be raising your prices. Only you will know if the reasons above fit your situation or not. If you found this post helpful, I’d really appreciate it if you’d tweet it or share it with others on Facebook or Pinterest. Just use the buttons below and spread the word. Thanks!